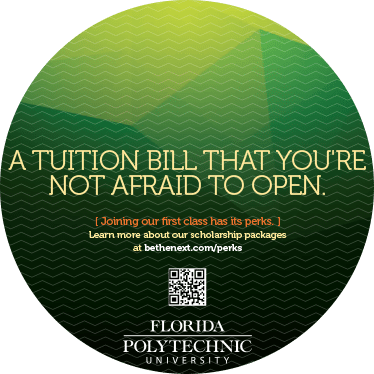 Florida Polytechnic is the newest public university (and only polytechnic) in the state. This innovative school stands out thanks to an emphasis on experiential learning and strategic industry partnerships with high-tech businesses. Impressive features, to be sure, but it takes more than that to jump-start enrollment. Without a student body, a finished campus or an established reputation, an out-of-the-box recruitment approach was definitely in order. Luckily, Echo Delta was up to the task. 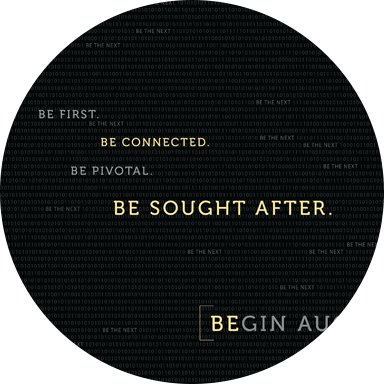 Create a compelling student recruitment campaign for an educational institution — one that didn’t even exist yet. Avoid inauthentic visual and verbal cliches. Pictures of smiling students attending Stock Photo University? Negative. Done-to-death class size stats? No way. Stodgy, buttoned-up writing style? Not on your life. Is it cheating to use a recent college grad to write a college admissions brochure? Maybe, but that’s what we did. From that point of view, it was easy to see the characteristics of Florida Poly that truly stood out. Without a student body or completed campus, Florida Poly definitely had its visual challenges. To avoid the risk of appearing inauthentic, Echo Delta ultimately decided against using stock photography, opting for sketchbook-style illustrations that got our message across in a fresh and original way. We also set up an admissions microsite — an updatable, real-time version of the viewbook that linked directly to the application and information request forms. 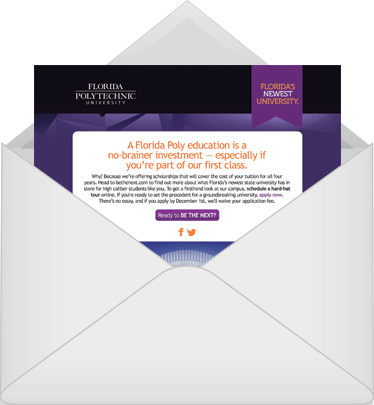 Because Florida Poly was growing and changing on an almost daily basis, we created easily updatable, category-specific blog feeds to provide the most up-to-date content. To drive more students to the Be the Next microsite, we mailed postcards to high school seniors across the state. We sent three different messages with unique QR codes to 5000-member student groups, measuring their level of engagement along the way. When a clear winner emerged, we shipped them out to 65,000 Poly potentials. We also kicked off a targeted, weekly email campaign encouraging 100,000 of Florida’s highest-performing students to visit the campus and begin the application process. 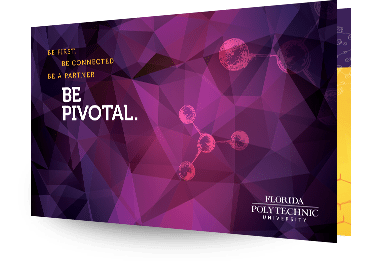 Donor materials in the spirit of the Be the Next campaign helped Florida Poly introduce itself to the community and start building a donor base. When the final application deadline hit, Florida Poly had nearly doubled its initial recruitment goal of 500 students. 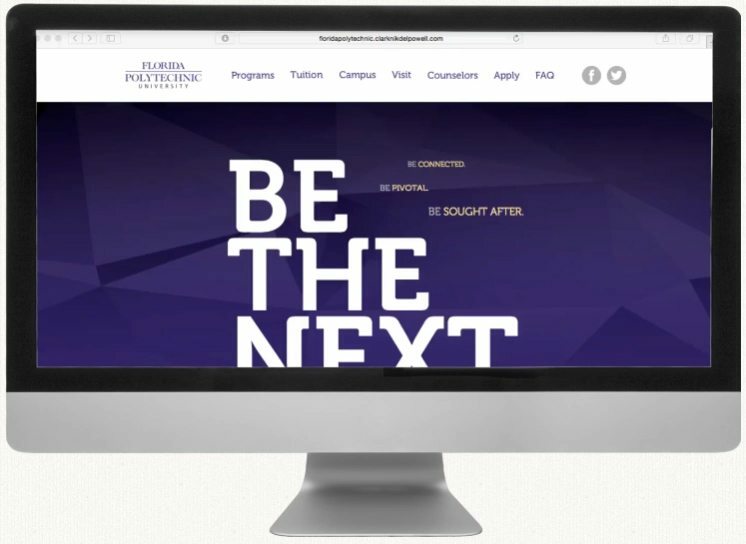 Following the launch of the Be the Next Campaign, Florida Poly received 3,000 applications, ultimately admitting 923 freshman and transfer students to its inaugural class.